General Motors announced today that the 2014 Chevrolet Silverado High Country and LTZ pickups and the 2014 GMC Sierra SLT and Denali pickups powered by the 6.2L V8 can tow a class leading 12,000 pounds when properly equipped. This impressive limit is achieved when the new Sierra or Silverado are fitted with the 6.2L V8 and the Max Trailering Package that includes four and seven pin trailer harness connectors, an enhanced cooling system, an automatic locking rear differential, a heavy duty 9.75 inch rear axle housing fitted with a 3.73 gear set, high strength rear springs, revised shock absorber tuning and an integrated trailer brake controller. 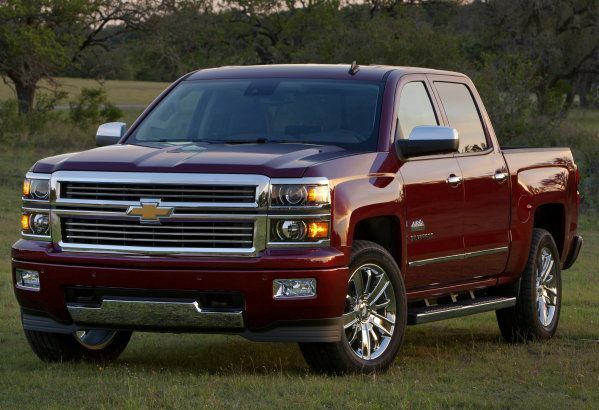 In addition to the 2014 Chevrolet Silverado and GMC Sierra pickups powered by the 6.2L V8 offering 420 horsepower, 460lb-ft of torque and 12,000 pounds of towing capacity, these trucks can also offer 21 miles per gallon on the highway in rear wheel drive form. Those rear drive trucks sporting the 6.2L V8 can expect to get 15 miles per gallon in the city while 4 wheel drive versions of these new GM trucks can look to get 14 miles per gallon around town and 20 miles per gallon on the highway. General Motors didn’t stop at making sure that the 2014 Silverado and Sierra were the most powerful trucks in the segment when powered by the top of the line 6.2L V8. The 2014 GM half ton trucks fitted with the 4.3L V6 that offers 285 horsepower and 305lb-ft of torque is able to tow 7,600 pounds – which makes it the best base V6 half ton truck on the market (not including the high performance EcoBoost V6 from Ford). Those 2014 Silverado and Sierra 1500 pickups fitted with the 5.3L V8 with 355 horsepower and 383lb-ft of torque are able to pull 11,500 when mated with the features of the Max Trailing Package for that drivetrain. This 5.3L V8 will offer incredible towing capabilities for a truck that also delivers 23 miles per gallon in rear drive form – making it the most efficient V8 truck available. The 5.3L is also more efficient than Ford’s highly touted EcoBoost V6. All of these new engines powering the 2014 Chevrolet Silverado and GMC Sierra 1500 pickups rely on technology like direct injection, Active Fuel Management (aka cylinder deactivation) and continuously variable valve timing – features which are available from the competition but not altogether in one vehicle. The result is a lineup of trucks that are among the most efficient and the most powerful sold in the US today.